Joe Spero’s hot hand got Silverado’s boys basketball team off to a quick start Friday. Spero drained his first five 3-point shots, all in the first half, and finished with 17 points to help the Skyhawks to a 90-63 home win over Foothill. Wade Collie added 24 points and 13 rebounds for Silverado, and Ali Sabra had 22 points and nine assists. The Skyhawks, Foothill and Liberty are in a three-way tie atop the Southeast Division at 6-1. Micah Shepard and Earl Jones each had 11 points for the Falcons. • Basic 66, Tech 54 — At Tech, Josh Ross scored 18 points and James Holmes 10 to lead the Wolves. Ben Seibert had 13 points for the Roadrunners. • Arbor View 51, Legacy 49 — At Arbor View, James Graham had 16 points and 12 rebounds to help the Aggies, who rallied from a 40-37 deficit after three quarters. Darington Banks added 16 points for Arbor View. Ira Haywood led Legacy with 14 points. • Cheyenne 65, Shadow Ridge 52 — At Cheyenne, Demetric Williams led a balanced effort for the Desert Shields with 13 points. John McCoy paced the Mustangs with 13 points. • Coronado 85, Del Sol 75 — At Coronado, Christian Hatch had 29 points and 17 rebounds to pace the Cougars’ strong inside game. Cory Ford added 23 points and Tommy Tebbs 10 points and 10 assists for Coronado. Joe Maglaras led the Dragons with 19 points. • Liberty 73, Green Valley 68 — At Liberty, Kenneth Peters drained three 3-pointers in the first quarter and finished with 23 points to lead the Patriots. Justin King added 22 points and 13 rebounds for Liberty, and teammate Milos Knezevic had 15 points and 11 rebounds. Rodriguez each had 20 points for the Gators. • Centennial 68, Cimarron-Memorial 56 — At Cimarron-Memorial, Adam Young scored 25 points and Anthony Consiglio 21 for the Bulldogs. Tyler Tuliau had 19 points for the Spartans. • Mojave 80, Palo Verde 62 — At Palo Verde, Darian Norris and Anthony Marshall each scored 24 points as the Rattlers ran past the Panthers. Liloa Nobriga had 18 points to lead Palo Verde. • Canyon Springs 72, Chaparral 49 — At Canyon Springs, Deremy Geiger drained six 3-pointers in the first half and finished with 32 points to pace the Pioneers. 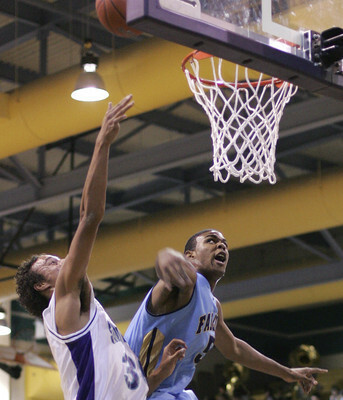 • Las Vegas 73, Rancho 67 — At Las Vegas, Marvin Campbell scored 26 points to lead the Wildcats. Zerrick Pryor added 22 points, including 10 in the third quarter as Las Vegas outscored the Rams 23-13. Perry Benson had 14 points for Rancho. • Bishop Gorman 87, Durango 64 — At Bishop Gorman, Kylel Coleman scored 25 of his 41 points in the second half to lead the Gaels back from a five-point halftime deficit. Quintin Dailey and Jordan Hill each added 11 points for Gorman. Jamal Crook and Marcus Falley each scored 17 for the Trailblazers. • Sierra Vista 60, Clark 36 — At Clark, Josh McLain scored 10 of his 23 points in the third quarter to help the Lions blow open a tight game. Nick Douglas added 16 points for Sierra Vista, which led by five at halftime. Isidro Garcia scored 12 points to lead the Chargers. • Bonanza 75, Western 61 — At Bonanza, Tomo Delp had 16 points and 13 rebounds to lead the Bengals past the Warriors. Al Castaldo added 15 points for Bonanza, which trailed by 10 points after the first quarter. Johnnie Diggs scored 19 points and Phillip Payne 18 for Western. • Tartan (Minn.) 73, Spring Valley 67 — At Spring Valley, Mark Sonnen had 40 points to lead the Titans. Jesse Chippoletti scored 17 for the Grizzlies. • Desert Pines 102, Agassi Prep 52 — At Agassi Prep, Pierre Jackson had 19 points to lead seven Jaguars scorers in double figures. Kimani Bullard and Chris Perry each added 14 points for Desert Pines. DeShawn Battle scored 13 for the Stars. • Trinity 75, Mountain View 29 — At Mountain View, Raphael Roberts and Kasey Montonini each scored 14 points to lead the Thunder. Cortland LeBoeuf had 10 points for the Saints. • Moapa Valley 62, Boulder City 57 — At Boulder City, Bobby Vallet had 18 points, including five free throws down the stretch to seal the win. River Frantz led the Eagles with 21 points, hitting five 3-pointers. • Faith Lutheran 54, Virgin Valley 32 — At Faith Lutheran, the Crusaders survived 18 turnovers for the win. Diontea Wright and Michael Amico each had 14 points and Chase Saunders 13 for Faith Lutheran. Doug Hafen had 13 points to lead the Bulldogs. • Beatty 47, Indian Springs 30 — At Beatty, Ivan Maldonado scored 19 points to lead the host Hornets.